Are you looking for a gift for a knitter? Not sure where to start? Not a knitter yourself? Fear not, here is a collection of gifts for knitters that are sure to be well received. There are more knitting books on our Knitting Book Review pages. With all the time a knitter spends on their craft it's sacrilege to see it stuffed in a carrier bag. A knitting bag or knitting needle case will help organise everything and keep it together. There are many knitting bags that combine beauty and utility. Take a look at some of the lovely bags at purlescence.co.uk. If your favourite knitter buys yarn in hanks and so needs to wind it into balls then this is a thoughtful gift. A nostepinne is designed for winding yarn into a neat 'centre pull' ball of yarn ready for knitting. Each nostepinne is lovingly hand crafted – something any knitter will appreciate. These nostepinnes are available in 6 different woods. Any knitter will tell you that you can never have too much yarn, especially if it is soft and beautifully dyed. Fyberspates Scrumptious yarn is a delicious blend of 45% Silk 55% Merino Wool in a sumptuous range of colours. A skein of luxury yarn will always go down well as a gift for a knitter. Luxury fibres include silk (not suitable for vegetarians), camel, cashmere, qiviut, mohair, angora and alpaca. Yarns which blend 40% or more luxury fibre with merino wool are also lovely to knit with. Pick a shade that the knitter wears a lot. For the ultimate luxury yarn buy a skein of Swiss Mountain 65% Cashmere and 35% Silk yarn or Camelspin 70% silk, 30% camel yarn. The colours are beautiful. 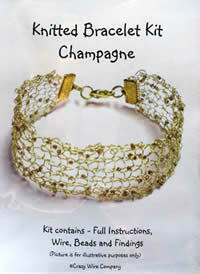 These knitted bracelet kits from the Crazy Wire Company are fun gifts for knitters. There is a wide choice of colours, so pick colours that suit the knitter's taste in clothes. They aren't expensive, so you could buy one of each style or a selection of colours. The kits contain the wire, beads, findings and full illustrated instructions. Just add knitting needles! Stephanie is a real celebrity in the knitting world. Famous not only for her speed of knitting but for her witty writing style. This book is a great gift for any knitter. Her books make me laugh out loud. Her tales of being a compulsive knitter and the scrapes she gets into will bring a smile to the face of any keen knitter. Her obsession with yarn and the way she manages to accumulate vast quantities of yarn strikes a chord with any one bitten by the knitting bug. This is the latest of her musings on knitting, life as a knitter and dealing with non-knitters. This book is great fun. The beautiful photographs make it an ideal coffee table book and a great gift. The price is really good too. Designs range from lingerie such as the one piece wonder shown on the front cover and embroidered stockings, to tops that take design elements from lingerie such as the waist-cincher top and the shaped lace tee. In the course of her career Joan McGowan-Michael designed lingerie and wedding gowns before moving into knitwear. She really knows which shapes flatter and how garments should be constructed. All the designs show real attention to detail, such as the instructions for short row shaping to accommodate the larger bust. As a knitter and yarn addict himself, Franklin Habit really knows what makes knitters tick, which is why the cartoons in this book really hit the mark. There are 75 cartoons and 9 essays in total. Look out for the lost knitting diaries of Jane Austen as well as cartoons that will give wicked ideas of what to do when someone is less than grateful for a knitted gift. It Itches is a fun gift for any keen knitter. If you know an experienced knitter who is also a history buff or likes traditional folk patterns then why not buy them a Sanquhar glove pattern? The patterns originate from Sanquhar, a small Scottish parish that had a thriving knitted glove and stocking industry in the late 1700s. 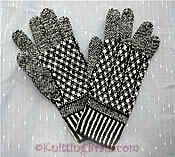 Traditionally knit in 2 colours, most commonly black and white, with initials at the cuff. The patterns are often named after people or events, like the Prince of Wales pattern shown. This pattern is thought to date from 1871 when the future Edward VII, visited Sanquhar. Another famous pattern is called Midge & Fly! You can buy a pack of 4 traditional Sanquhar knitting patterns from eurojapantrading.com. The Loopa is a great gift for any knitter with more yarn than time. The Loopa enables you to make stylish boa scarves in an evening. It's a great knitting yarn stash buster. Combing a bulky yarn with a light novelty yarn gives a great effect. It's also really useful for variegated yarn that looks great in the skein but disappoints when knitted up. 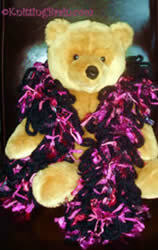 Chenille yarns give a really luxurious scarf that can be worn with evening wear. All you need is imagination. It's a good idea to pick 2 yarns that are roughly the same length. The Loopa is also a great for kids because the progress is so fast they won't have time to get bored! There are 2 sizes available, the standard and the mini Loopa. You can buy online or at all good knitting shops.